February | 2015 | Breathe. Sweat. Smile. It’s that time of year where hearts open and we should be filled with LOVE! This month Julie demonstrates a variation of Anjaneyasana (aka low lunge). This pose is not only great for the hips but opens the heart as you lift through your chest while you enter spinal extension. 1) Releases tension in your hips. 2) Helps build mental focus. 3) Stretches the hips, quads, and hamstrings. 4) Helps to improve the strength and flexibility in your hips, legs, shoulders, arms, abdomen, back and knees. 5) If you suffer from sciatica pain, this pose is also good for you as it stretches and soothes the hamstrings and leg muscles. 6) As a heart-opening exercise, this pose is of course also beneficial for the heart chakra and stimulates the Anahata energy. 7) This pose is especially good and recommended for athletes and runners as it gives a beneficial stretch and stimulation to the lower body. Meet Teresa, Teacher of the Month! Teresa in her favorite pose, fire log. I started to give yoga a halfhearted chance in my early 20’s to help combat stress and to try something new . After practicing on and off for a year or two I started going to yoga regularly and began to see positive changes off the mat. I was less stressed, confident, happier and more myself than ever. 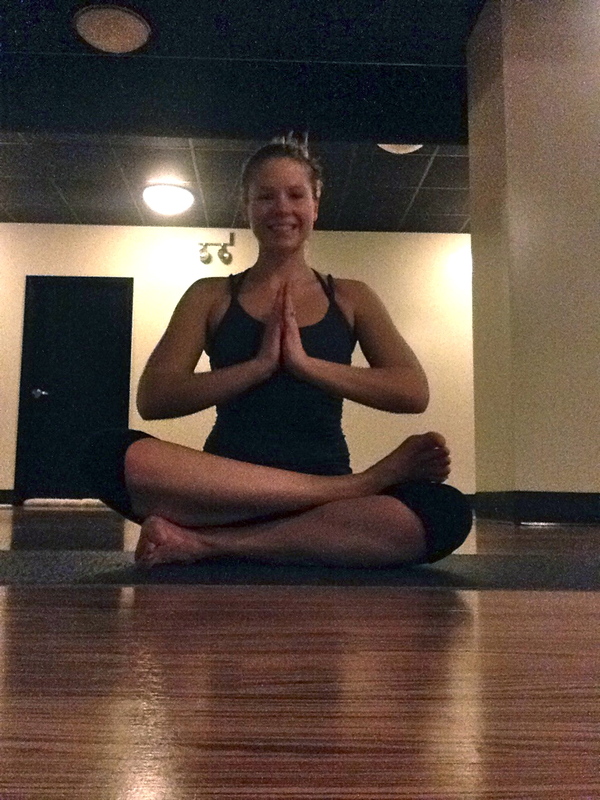 Yoga has changed my life so much- I want to share yoga with anyone and everyone I can! I love helping people feel good. I also truly enjoy teaching- Even at 6 am! Agnistambhasana- Fire log/ Double Pigeon. It look me a long time to be able to enjoy this pose! It reminds me of how much I have changed in my practice. My Students! My goal of every class is to connect with them through yoga and help them feel better. If I can help them feel better even just for 5 minutes, I am happy! And of course the amazing teachers at YBD- I love our community and the wealth of knowledge and love for the practice you can find here. Relax! Its just yoga. Don’t be afraid to fly or fall. And seriously, nobody cares if you can’t touch your toes!